Sponsored post on behalf of SSV – story is my own. One of the most crazy things in our life is STRESS, as people, workers, co-workers, professionals, brothers, sisters, aunts, uncles and as parents, we are simply maxed out in the area of stress. It’s not hard to find the best ways to reduce stress but is is hard to find the best products to help us on the stress-relieving path. Who needs picked up from a sport, who needs dropped off, who has a work deadline, what co-worker did the wrong thing, making you work harder to do the right thing, it is all stress-inducing. Simply taking a ride down the road can create stress when you are in a hurry and the person in front of you is not. Suddenly you might find yourself white-knuckling your steering wheel trying to keep your ugly thoughts to yourself. Stress plays a crucial role in our moods, in how we react to situations and our overall well-being so it is important at we learn the best ways to reduce stress and plug them into our lives. Lavishly live life out loud and check out the best ways to reduce stress in your life. I know this sounds so ridiculous to you, but if you don’t have enough water in your body it can not function properly. You need to drink at least 32 ounces of water per day because your body is made up of 60 % WATER, so drink and keep yourself hydrated. Plenty of water can help curb bad breathe as well as eating in between meals. Well, let’s just say that if you can’t get to bed early, at least get to bed and sleep a minimum of eight hours because your body needs time to tone down from the day, and purge all activity. Sleeping is crucial to maintaining balance and focus in your days and not being cranky which can lead to stress-inducing situations. Exercise is ultra important as it is great for your heart and for your mind, but beyond the basic benefits, exercise is a great way to reduce stress. As you walk, jog, kickbox, cardio blast, bike etc, you anxiety levels will lessen and so will your stress. If you did not believe your mom when she told you that taking vitamins was a critical part of staying healthy you were wrong. Taking vitamins can help you reduce your stress levels. B12 Energy Burst, Vitamin C “Tangy” Orange Melts, Vitamin D, CoQ10, Vitamin K and Melatonin all are key to helping reduce stress. Let’s take a look at Superior Source Vitamins, the Vitamins my family personally uses and loves! 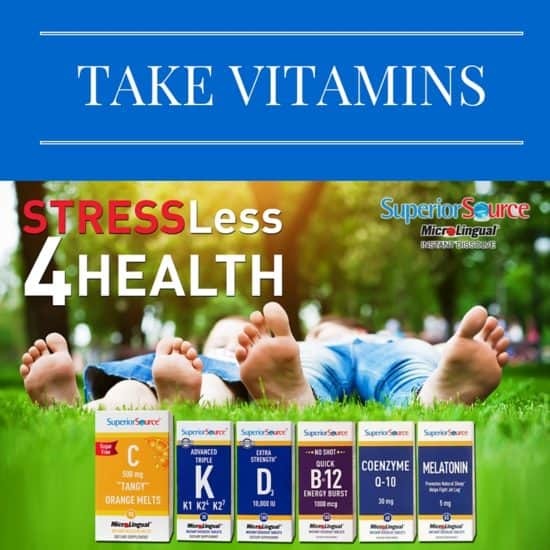 It’s time To Stress Less 4 Health and here is why we LOVE Superior Source Vitamins. So where do you find these awesome products? Superior Source Vitamins can be found at major retailers nationwide and major online retailers like iHerb and Lucky Vitamins. Check out Store Locator to find a store near you. Superior Source Vitamins offers great quality products that I trust to take myself and give to my family. I know you will find the same quality as well! This is the Vitamin Six Pack I have been using to reduce stress. Get the natural energy you need to keep thriving! Quick B-12 Energy Burst is specially formulated with Vitamin B-12, herbs and energy boosters to support your active lifestyle and overall vitality. Vitamin C is an essential nutrient that cannot be produced by the body, therefore, it must be replenished daily. Vitamin C has several beneficial purposes including developing and maintaining healthy skin and bones, to form collagen and also enhances the absorption of iron from plant-based foods we eat. Vitamin C also provides support to the body’s immune system. NO sugar added; only sweetened with a little stevia. This is preferable to most “chewable” vitamin C products that typically are loaded with lots of sugar. Vitamin D works in conjunction with calcium to promote the development and maintenance of strong bones and teeth. Vitamin D products are D3, the finest source of Vitamin D available. GMO FREE! CoEnzyme Q-10 is present in most energy-producing areas of the body and appears to have a connection to the support of healthy heart function among other possible protective and regulatory functions. Triple Vitamin K (K1, K2-MK4, K2-MK7) supports normal blood clotting and the formation of prothrombin. Superior Source goes to work fast, under the tongue. GMO Free! Melatonin acts as a natural aid for healthy sleep regulation and the promotion of normal sleep cycles during travel. Chamomile is an herb that works together with melatonin to promote calmness and restfulness. Pharmaca: Save 20% on Superior Source during the entire month of March! Sprouts: Super Sale the entire month of April at all Sprouts location. Jimbo’s: a 5-store chain in the San Diego area: www.jimbos.com. All SSV vitamins on sale at 20% off during the month of April. Lavishly live life out loud with the Best Ways to Reduce Stress and in the process get a little healthier. Are you ready? Now I know how to reduce my everyday stress because of your suggestions. Thanks a lot! I totally agree with your article. But which is the best way to take Vitamin C? Is tablet more effective or raw vegetables? Wow, great post! Making sure you go to bed at a decent time so you can wake up early and feel rested is certainly important. Another great and natural stress reliever would be medical or recreational marijuana if you live in an area where is has been legalized. Thanks for sharing! Indeed a very nice share.. I am so pleased to found your page and I must say that the ideas are really interesting and beneficial.. Stress is a mental-physical phenomenon: your mind’s notion of a danger encourages your hypothalamus to start the physical cascade of the stress reaction. Also, good social support is among the most powerful aspects in bringing down stress. Individuals who have friends and family that support them are more stress repellent, and they don’t carry the stress alone. After reading this I can say that this is the best guide for those who really suffers from this problem. Thank you so much for the share..
Thumbs up to your blog buddy.. Excellent advice. I sleep well, exercise and drink plenty of water to reduce stress. Stress is an aspect of life that we can’t wish away; but learning to manage it keeps us in tip-top condition and helps us face the challenges of life and every day living.. When I’m stressed out I like to crochet it calms me and I enjoy doing it. Some great tips – I could use some of these right now! Thanks for sharing! These are great ways in reducing stress! My stress reducing activities are walking, reading and cooking. I should start taking some vitamins too! I take the Vitamin C and run whenever I get stressed, running just helps work out all that tension you are feeling. I swim in our pool. To reduce stress, I read and talk to my cat, who always has good advice! I definitely need this in my life! I stress way too much. It’s great to know that there are supplements out there that can help. These are great! I need to practice more stress-relieving activities… Ugh! This is a great giveaway. I have been trying to eat healthier this year and i would like to start taking some supplements. Thanks for the great information. This is a great post. As a mother I’m often finding myself stressed. I try to get lots of water in during the day. I know that I don’t get enough sleep, so that’s something I need to work on. I’ve never heard of this brand of vitamins before, but it sounds like good one. 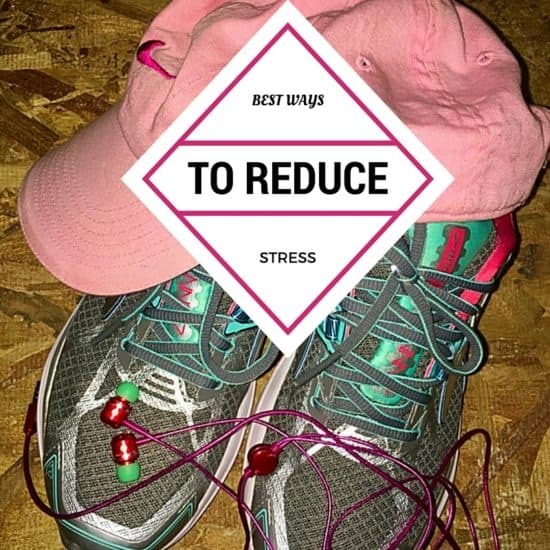 These are definitely some great ways to reduce stress. Water is definitely a must anytime you want to reduce stress. Toxins in your body can cause your stress levels to get higher and higher and higher! Great tips! I don’t take a lot of vitamins but the other options are certainly great for me! Maybe I should consider some of these supplements too! I found exercise to be a great stress reliever. I also turn up the music when I need inspiration. I started taking fish oil a few months ago. YES on plenty of water and plenty of sleep!! These are all great tips on reducing stress. It’s so much more important to get in plenty of water than people think. It really does help with stress relief, because being dehydrated can affect they way your mind works. I try to get a full night’s sleep every night, and it really helps with my stress level. Melatonin is a great help with that. Hmmm… can’t I just hide from the world instead? LOL Seriously though, I love running and yoga to help kill off some stress. Plus, as I’ve gotten older, I’ve learned to let a lot less things stress me out.